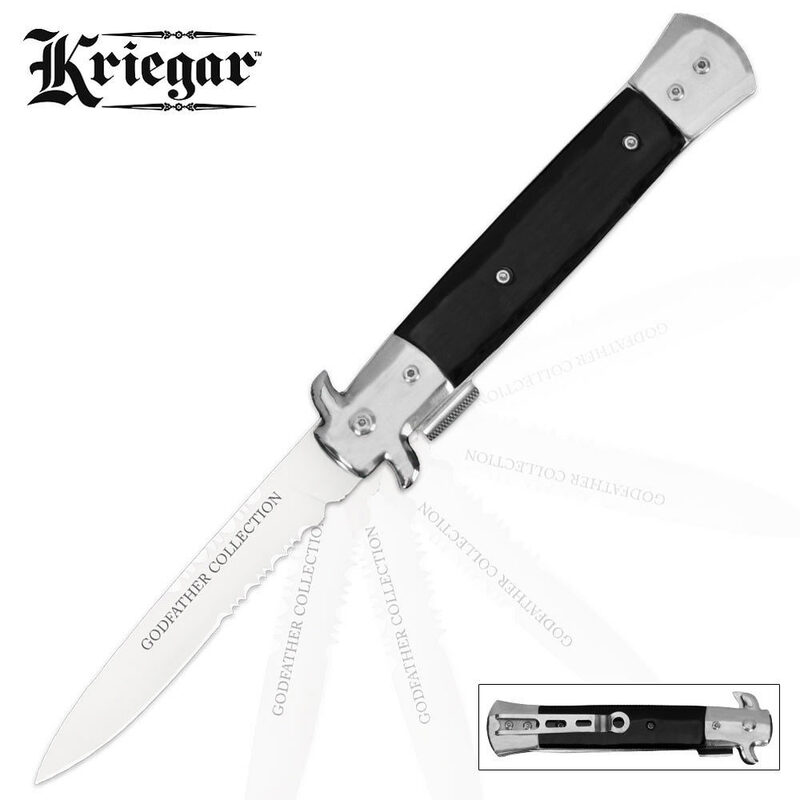 Kriegar Godfather Stiletto Black | BUDK.com - Knives & Swords At The Lowest Prices! This Kriegar stiletto is part of the Godfather collection of beautifully crafted stilettos, reminiscent of the knives mobsters carried. Best $13 knife you'll ever find! Nice heft. Beautiful dagger blade. I don't mind the serrations, they are VERY sharp! Flips open with a nice SNAP. Liner lock tab makes closing easier. Serrations on the flipper make opening easier. It has a basic look in black & silver. It's not gaudy, looks classy. Well made. I love it! Bought two of these. Much better quality than expected. The blade is razor sharp out of the box. As other reviewer said it is a good idea to put some threadlocker on the screws. I also took a small flat file to the portion of the blade where the liner lock engages the blade. A few passes with the file allowed a much more solid lock-up by letting the liner lock engage the middle of the lock up surface of the blade. Overall this is an excellent "gentlemans knife" or every day carry knife. Highly recommended. A nicely designed, single purpose self defense weapon, but held together by tiny Torx screws which will inevitably loosen, causing the kick spring to become inoperable. Buyers of this knife and other similarly built Asian assisted openers will be wise to remove all the screws and put dabs of thread locker on them to keep the knives intact. Thread locker is especially important on screws holding the blade pivot pins and bolsters. Good knife as advertised. Great quality. However I don't like the serrated blade and not sure why you would put that on a stiletto. It gets stuck on your pants on the draw, but you can modify the knife as you see fit and it will stop. Mine had a serrated blade and the assisted open needed a little adjusting but it works really well overall. Black composite handle left something to be had though. It's built solid and I like it's weight. It's a handsome knife that lets you flick it open with style, if so desired. The blade is sharp and the serrations guarantees whatever you are slicing gives way. Of course in case these are letter envelopes. Great addition to my knife collection. I have many stilletos all of which came from Bud K. This has to be the best one I've bought yet! The partial serrations on the blade really set it apart from other high polished blades. I used it to open the rest of the items in my order. The serrations went though some zip ties like they were packing tape. It's a very bold looking blade to say the least. It flicks open with little or no effort. This is great addition to the Bud K line-up and any stilleto collection.